A cathedral ceiling emphasizes a circle-top window over the sliding glass door to the large sunroom in this four-bedroom home plan with covered front porch and dual fireplaces. The large country kitchen with center island is open to the family room, which can convert to a dining area to expand the great room. 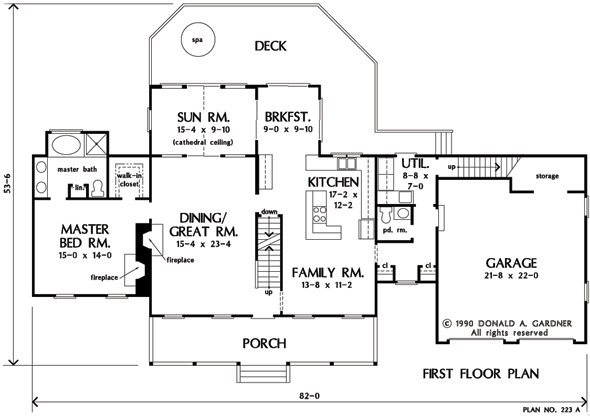 A large bonus room over the garage adds even more space to this floor plan. 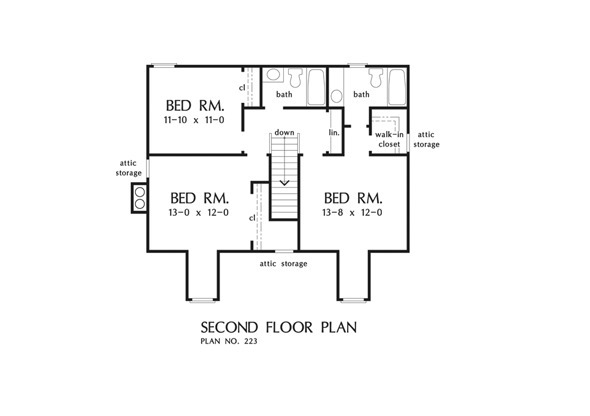 The first-level master suite has its own fireplace and master bath with a whirlpool tub, shower, and double lavs. 1st Floor: 1638 Sq. Ft. 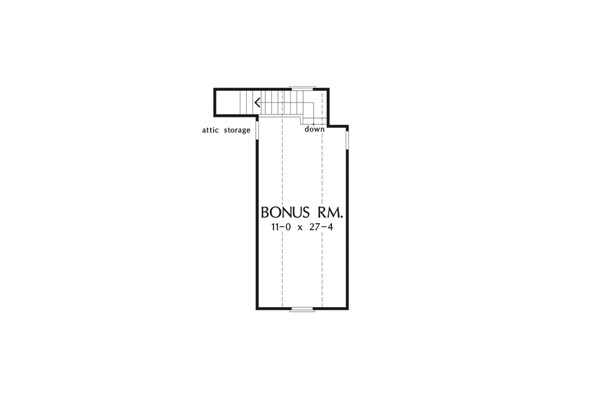 Bonus Room: 334 Sq. Ft.
House Dimensions: 82' 0" x 41' 6"
Great Room: 13' 8" x 11' 2"
Dining Room : 15' 4" x 23' 4" x 8' 0"
Great Room : 13' 8" x 11' 2" x 8' 0"
Kitchen : 17' 2" x 12' 2" x 8' 0"
Breakfast Room : 9' 0" x 9' 10" x 8' 0"
Utility Room : 8' 8" x 7' 0" x 8' 0"
Bonus Room (Vaulted): 11' 0" x 27' 4" x 8' 0"
Garage : 21' 8" x 22' 0" x 0' 0"
Garage Storage : 10' 9" x 5' 0" x 0' 0"
Master Bedroom : 15' 0" x 14' 0" x 8' 0"
Bedroom #4 : 11' 10" x 11' 0" x 8' 0"
Porch - Front : 33' 8" x 7' 2" x 0' 0"
Deck / Patio : 33' 8" x 12' 0" x 0' 0"
Other (Cathedral): 15' 4" x 9' 10" x 14' 0"